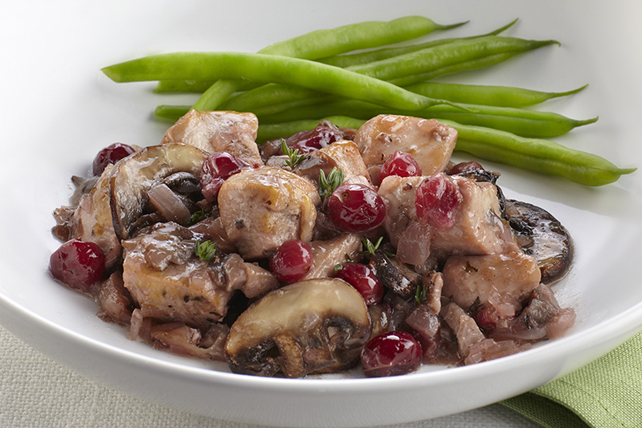 This sweet-meets-savoury recipe features cranberries, apple juice, mushrooms and chicken - the perfect recipe to serve on a crisp fall evening. Heat oil in large nonstick skillet on medium heat. Add chicken, mushrooms and shallots; cook 5 to 7 min. or until mushrooms are golden brown, stirring frequently. Add remaining ingredients; mix well. Bring to boil; cover. Simmer on medium-low heat 20 to 25 min. or until chicken is done, stirring occasionally. Serve with hot cooked quinoa or rice and steamed fresh green beans. Garnish with chopped fresh thyme or rosemary before serving.